What the press say ! 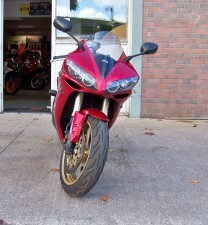 An incredibly well sorted Fazer 1000 with the ability to waste sports bikes, in excellent showroom condition. 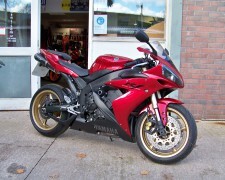 Handling has been enhanced with the addition of an Ohlins adjustable rear shock and front fork internals. Improved braking from an “AP” master cylinder combined with braided hoses and R1 Gold series calipers, biting a pair of wavy discs up front. 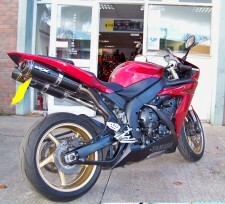 Engine BHP has been upped to over 150bhp via a full Akrapovic exhaust system combined with a Dynojet kit. Other extras include a colour coded bellypan and a very useful Renntec sports rack has been fitted too. There is 38797 miles on this example and both keys are present. Tyres, chain, sprockets and brake pads all in excellent condition. 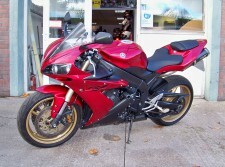 Sold serviced and with 12 month MOT. Starting in 2006, as a small used bike dealer and workshop, Moto-Tempo has built a reputation as a leader in aftermarket motorcycle and ATV products, now we are much more than that! No matter what you're looking for, Moto-Tempo carries all the 'toys' for sports enthusiasts of any age. From protective gear (jerseys, gloves, pants, helmets and boots) to casual wear and accessories, Moto-Tempo will appeal to even the most discriminating shopper.